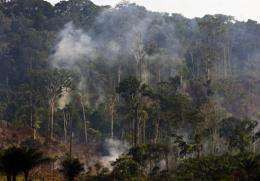 Trees of the Amazon rain forest burn. More than 60 percent of deforested areas of the Brazilian Amazon forest are used for grazing cattle, while only five percent is used for agriculture, a new government study said. More than 60 percent of deforested areas of the Brazilian Amazon forest are used for grazing cattle, while only five percent is used for agriculture, a new government study said. From research of satellite imagery, Brazilian officials found of the 719,000 square kilometers (277,000 square miles) cleared up to 2008, a whopping 62 percent was left as just grass, and that the use amounted to on average one cow per hectare, roughly the size of a football field. "Having less than one head of cattle per hectare is unacceptable," said Environment Minister Izabella Teixeira in comments quoted by the Brazilian press Saturday. "It's a waste, because the forest is being replaced by something that does not generate income or growth," she lamented. While five percent of the land goes to agriculture, some 21 percent is effectively abanonded and left to its own regeneration. Brazil, which has jurisdiction over most of the Amazon, the world's largest rainforest, has committed to drastically reduce deforestation by 80 percent by 2020, though preliminary data indicates that in the last 12 months the process has in fact increased by some 15 percent, according to government figures. "some 21 percent is effectively abanonded and left to its own regeneration"
They mean it is returning to rainforest. Isn't that good? No! You are not suppose to read between the lines of official government propaganda. Ask Environment Minister Izabella Teixeira, Al Gore, or glorious leaders of the UN's IPCC. Great news for science; Sad news for AGW scamers! NASA recorded and promised to release videos of changes in the Sun from its quietest period in years to the activity marking the beginning of solar cycle 24 ! What a sad, sad day for world leaders and government scientists who agreed to manipulate experimental data for research grants! @omatumur: It is a pity that you have missed the really important message regarding this deforestation - the fact that, on average, every hectare of some of the world's most species diverse rain-forest is being eradicated simply to provide grazing for a single head of cattle. Whats really sad is that green policies are encouraging deforestation to grow crops destined for biofuels. What is really sad is that green policies are encouraging deforestation to grow crops destined for biofuels. The above NASA videos on the Sun may end the AGW scam, the SSM fable, and the careers of many world leaders.